How do we as leaders promote engagement of teachers, parents students? 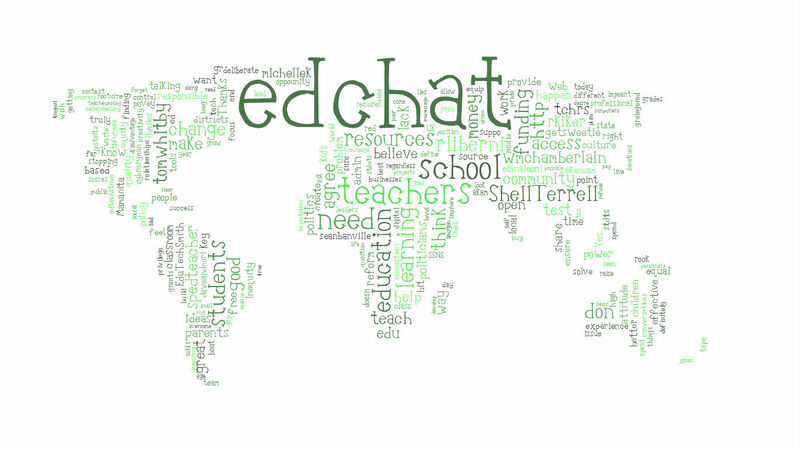 Our thanks for this week’s #edchat summary go to Joan Young (@flourishingkids). Her educational background and interests make her an ideal choice for his topic of full integration of all stake-holders into the learning process. I am sure you will agree that such a complex topic is not an easy one to pin down and Joan has done an excellent job. See more about Joan in her bio at the end of the summary. Engagement is a key issue in education these days as we work to develop school environments that promote learning, critical thinking and teamwork among teachers, parents and students. At a time where budget crises, political agendas and cultural pressures threaten the efficacy of teachers and students, we must work together to mobilize and change the fabric of education. From the physical structure of a school campus, with its signs, fences and buildings to the reciprocal communication with parents and students, leaders must create a positive experience in a safe enough environment where both teachers and students will take the necessary risks in growing and learning. With new technology, rising awareness, and a greater variety of participating stakeholders like those here on edchat, we have a wonderful opportunity to work on increasing engagement. Although the topic was engagement of teachers, parents, and students, much of the discussion as highlighted in themes below centered on getting parents more involved. As we realize that parents are critical activists in demanding change from schools, we need to mobilize and utilize their skills, develop understanding and promote involvement for positive change. We must understand what engagement looks like in our settings. Active, talkative, excited students in class then sharing with parents? Barriers to parent engagement include preconceived notions of school from parents’ own life experiences. Our campus, modes of communication with parents, students, teachers must facilitate, not block open dialogue. Students must lead the way, through student led conferences, guiding parents on school activity, learning nights. Parents have valuable insights and expertise that we need to discover, mobilize. Active parents can engage other reluctant parents. Communication via all tools available must be utilized so that all families are reached. Can’t assume all have tech access. Teachers are reluctant at times to lead due to increase in duties, peer pressure. Admin. can create safer environment for this. We must share our student successes and let students vocalize, publicize them so that others can see the great models of engagement. As we engage students through relevant, meaningful learning experiences, they will share their learning at home. @pughamy: #edchat people act because they are inspired, not swayed. how do we become leaders that inspire change? @L_Hilt #edchat You definitely need to bring the parents into the school as often as possible. Design day & evening activities for learning 2gether! With so many community members with expertise and resources available to us, and the tools of Web 2.0 how are we utlizing them? Are teachers and admin. using our local and global connections to inspire kids to discover their passions, interests through mentor visits, author visits, etc? My name is Joan Young aka @flourishingkids on Twitter. I will be teaching 4th grade this year in Menlo Park, California after many years of teaching Kindergarten/1st grade. As a former foster care social worker and clinical therapist, I’ve always been particularly interested in the connections between environment, emotions, relationships, cognitive science and learning. I am passionate about discovering how we can utillize the unique strengths of our students, their parents and our colleagues to facilitate lively, engaging classrooms and exciting, thriving school environments. I enjoy learning and writing about a variety of subjects, particularly how we can garner the power of positive emotions and trusting relationships to facilitate higher cognition and growth among our students. I believe that as educators we must help kids discover the unique ways that they learn so that they can take on challenges and pursue their interests to the fullest. I am also passionate about joining together with educators around the world who truly want to actively engage in dialogue and actions for meaningful change in schools. You can read more of my reflections at http://allkidscanflourish.blogspot.com and http://365mindfulmoments.blogspot.com . If you have never participated in an #Edchat discussion, these take place twice a day every Tuesday on Twitter. 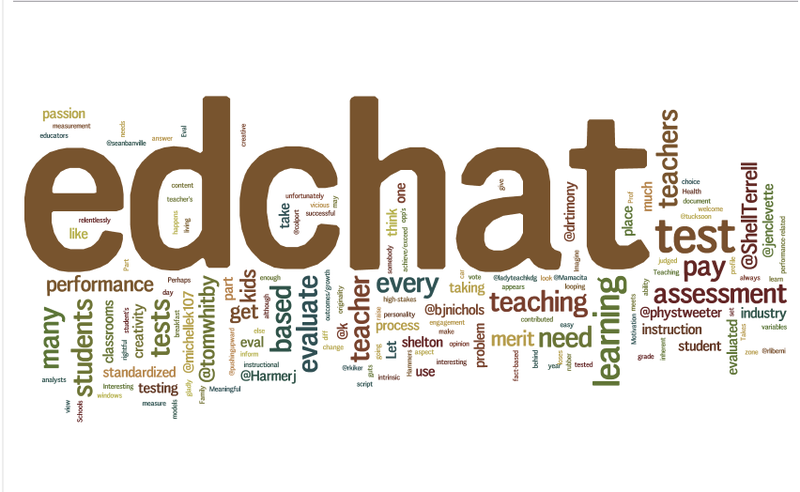 Over 400 educators participate in this discussion by just adding #edchat to their tweets. For tips on participating in the discussion, please check out these posts! How can K12 & Higher Ed better work together to promote positive change in education? K-12 through Higher Education one big happy Edu family! 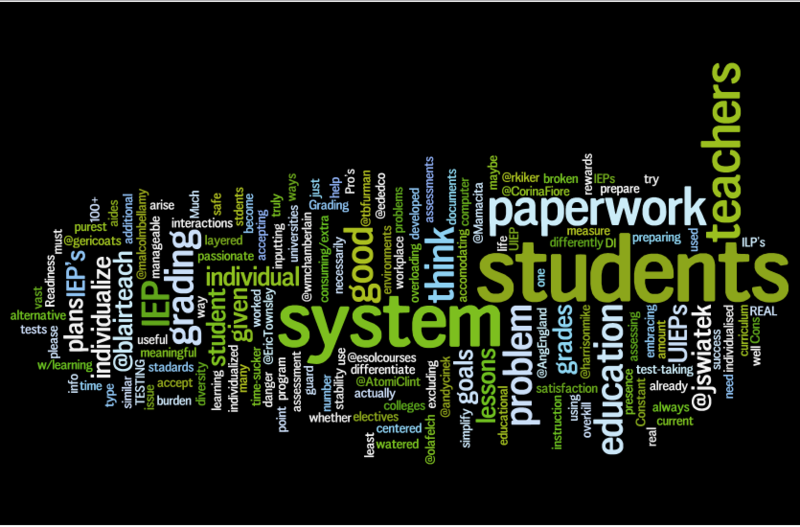 Tuesday’s #edchat topic was a difficult one with a very wide scope. It was also a frustrating one with twitter problems causing all twitter clients to freeze and run slow. Despite the numerous problems we kept on with the discussion and our very intrepid guest blogger Tania Ash (@tcash) has produced an amazing summary for us. I think you will agree that it is a magnificent job! Thank you Tania. Tania is a great evangelist for the use of technology in education (you can read her bio at the end of her post). Though part of one big education system, K12 and Higher Ed are sometimes viewed as two separate entities that may or may not be working hand in hand. For many students, the transition between K12 and Higher Ed is a difficult one. Students entering Higher Ed must deal with new learning environments and approaches, demanding curricula – many factors intersecting that can affect student performance. Though K12 and Higher ed share the common goal to produce competent, confident and productive members of society, there is a definite need for improvement in terms of the ways in which they work together to strive towards positive change. 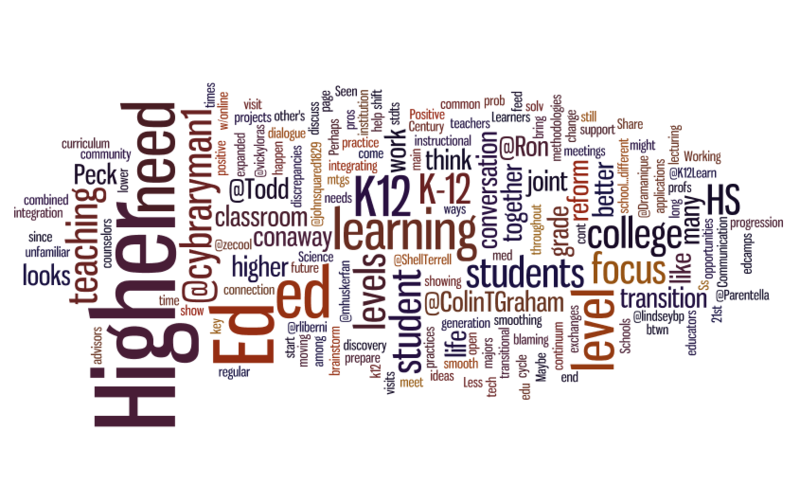 Though this #edchat conversation was about K12 and Higher Ed working together to promote positive change, there was also related discussion about pedagogical practice in Higher Education. Many edchatters found fault with the more traditional, lecture styles used in Higher Education. Higher Ed teachers were perceived as being very specialized in their domain-specific subject matter, but edchatters called for professional development, collaboration and networking for teachers at all levels (including Higher Ed) to become better pedagogues. In a follow-up blog post, @readywriting, a college professor pointed out that college professors are under pressure to conduct research instead of improving teaching, and that, while university professors may need to work at becoming better teachers, they should also be given credit for being passionate and competent in their field. 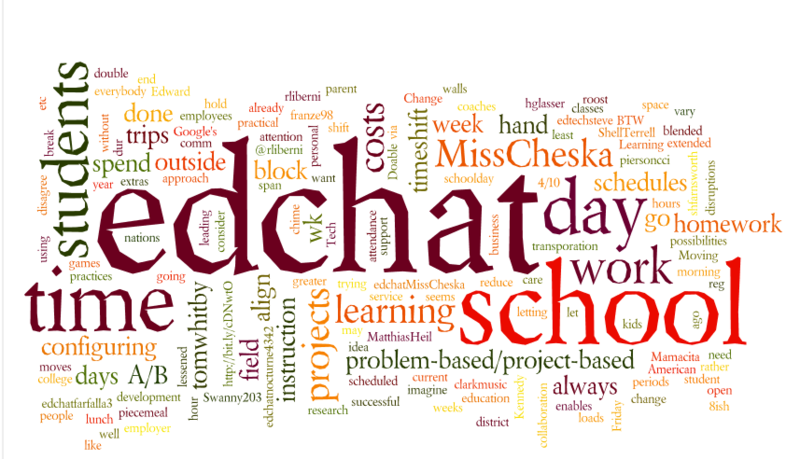 As is usually the case for #edchat conversations, the hour ended all too quickly with many new ideas and questions to mull over. Thanks to @ShellTerrell and @rliberni for being outstanding moderators! Though it is important for teachers to be well versed in their domain content, they must also understand how to service all learners. This is true for teachers in K-12 as well as in Higher Ed. @Todd_conaway: Less blaming, more conversation, more integration of long known K12 practices in Higher ed. @Todd_conaway: What looks more like a “work” or “life” environment, a K12 classroom or a college classroom? @Ron_Peck: Higher ed and k12 need to be on the same page of what the positive change looks like. @mhuskerfan: Higher ed and K-12 both need to shift teaching methodologies to more PBL, real life applications to meet our 21st Century Learners. @zecool: Too many times, focus is on institution (Prim., HS, HE). Ultimately, should be only 1 focus: the student. It’s a learning continuum! @Dramanique: I think college advisors should visit HS to discuss w/ counselors what stdts should b focusing on for future majors. @Ron_Peck: Positive reform can happen and begin with better student teaching focus. How do we measure metacognition? Then, how do we help students develop metacognition and assess? Should learning portfolios be lifelong portfolios that students can take with them wherever they go? What kind of tools can be used to create portfolios that are portable and can evolve with the learner? What are the best ways to encourage students to reflect on, and take charge of, their own learning? My name is Tania Ash (@tcash). I am a 5th grade teacher in Rabat, Morocco. I love teaching in an international school because of the built-in diversity and the stimulating challenges inherent in being part of such a transient community. I facilitate a student-led ecoAction group that has successfully undertaken projects such as bringing paper and plastic recycling to our school community. I am also the lucky mom of a fantastic preschooler. In my spare time, I am a graduate student in educational technology, currently doing research on the potential of Web 2.0 tools to improve student learning. I rely on my PLN, especially the Twitter community, for my daily source of inspiration. I am honored to have been asked to create this guest post! Tags: #edchat summaries, Edchat, edchat discussion, edchat discussions, edchat guest blogs, Education, Education in the 21st century, Education reform, education today, educational blogs, Educational equality, Educators evaluated by student scores, Empowering teachers, Merit pay, Rewarding success in teaching, Teacher development, What makes a great teacher? Our #Edchat summary this week has been written by another passionate edchatter Adam Burk (@pushingupward). I’m sure you will agree that Adam has done a great job in capturing well what was a very insightful and lively debate. Adam is a great campaigner for reform, not just in education. Read his blogs for more information. Links to these and bio below. The news is filled with stories about our failing public education system in the United States. Lately, a lot of focus has been put on teachers as a significant cause of the problems in schools. This week #edchat’s focus was on one of the current leading proposals to improve performance in our schools: Accountability of teachers based on their students’ scores on standardized tests. For example, Race to the Top funding is contingent on states breaking through union blocks to create such measures for teacher evaluation. Race to the Top measures are similar to current programs which thus far are failing in Chicago according to preliminary findings. Nonetheless, just like No Child Left Behind was shoved down public school’s throats, here comes more mis-guided reliance on high-stake testing to prove not only students’ ability, but teachers’ as well. During this #edchat discussion it was made clear that the emphasis on high-stake standardized tests is not welcomed by this group of educational professionals. Potential advantages of said proposal were not clearly identified. It undermines efforts to implement meaningful change in pedagogy to support students to be successful in the information age. Standardized tests are a tool in public education that divorces students from their inherent passion for learning. Schools need to become places that foster passion and creativity both in students and teachers. Current proposals in education reform fail to do this. Innovation in assessment and accountability are needed, this is agreed upon, but what exactly this looks like is not. If tests are to be used, they must learn to share the spotlight with other forms of assessment and feedback. There is support from some for 360 degree reviews where student, peer, parent, and administrator feedback is utilized to comprise a comprehensive review. But even before we define our evaluation methods we must redefine education in the United States. Even with higher test scores our students and schools will not be meeting the needs and challenges of today’s and tomorrow’s workplace, nor our global situation. Thus, we must align our purpose of education with aiding students to be inspired, sophisticated, thinkers, doers, and citizens, who actually are prepared to meet the challenges that are before them. Higher quality means of assessment should be emphasized and fostered instead of standardized tests. To define what good teaching looks like we must first redefine education; otherwise we are bolstering bad habits. @MissCheska #edchat I think teaching to the test focuses more on fact-based instruction than a more holistic instruction; it loses sight of bigger pic. @Harmerj Interesting #edchat. problem with performance-related pay is the many many many diff variables u wld have to use to evaluate performance! @rjwassink #edchat My union contract says I get a raise every year… whether I improve or not. Why??? How are public schools aligned or misaligned to develop a citizenry prepared to deal with the issues of today and tomorrow including humanitarian, ecological, economic, and political crises? datruss: See Dan Pink on Motivation http://youtu.be/u6XAPnuFjJc Are good teachers the type to be motivated by merit pay? Adam Burk can only be defined as one thing for sure, a human being. Bound by this condition he does the best he can to learn, grow, play, do good, and be of service. He believes we are largely looking the wrong way in our discussions in education reform. Ultimately, we must be talking about cultural reform, developing profoundly sane personalities for planetary citizenship. This looks like individuals contributing to the aims of The Earth Charter and is the enactment of Aldo Leopold’s Land Ethic. While his activities are many–philosopher, wilderness guide, teacher, social worker, gardener, husband, dog whisperer, naturalist, cook, jewelry maker, lover, healer, writer, community activist, change agent, and more–he is guided by the simple principle to do good in the service of others. He lives on the beautiful coast of Maine. Adam blogs at Pushing Upward: Growing a Culture of Peace and Cooperative Catalyst. He can be reached at pushingupward@gmail.com and found on twitter as @pushingupward. Saving District Money: 4 day Week/Extended school day. 1,000 participants and 4,000 tweets!! 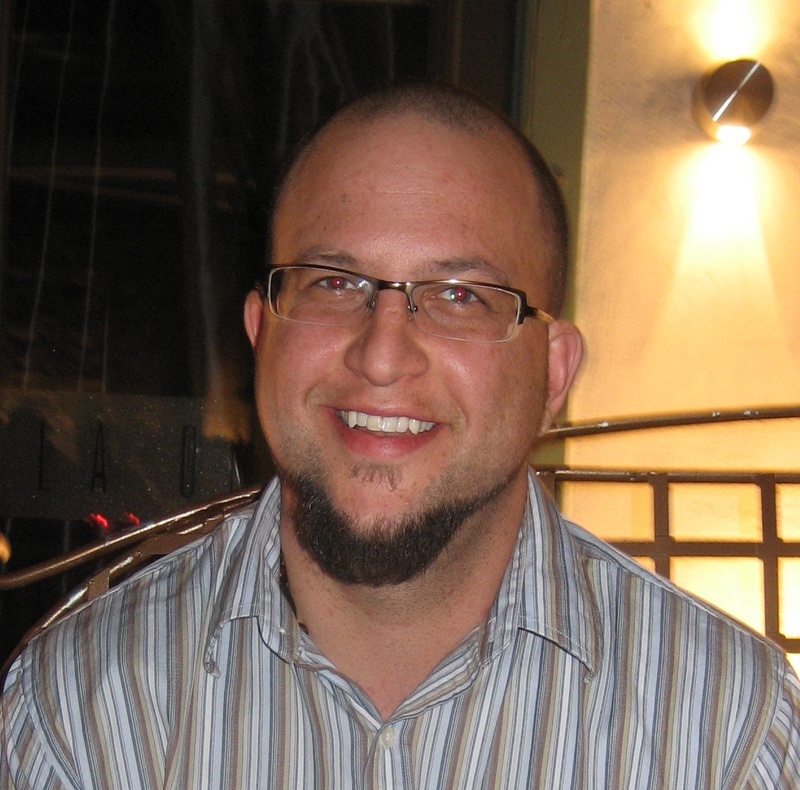 We’re thrilled to have John Steltz (@jpsteltz) providing this week’s #edchat summary. He is a regular at edchat and devoted to technology in education. I think you will agree that his summary is a very thoughtful representation of what was a great discussion! See John’s bio at the end of the summary. Our topic began with several pros/cons to the idea of having a four-day school week and extending the hours of those four school days. The topic transformed from a discussion about funding and budgets back to doing what is needed for our students. Great educators always bring every discussion back to creating opportunities for our students to be successful. We may want to consider blended classes using Technology to timeshift learning and reduce time in the building. Are any coaches going to chime in about games, practices, etc? Those always ruled the roost here. What about configuring A/B block schedules to align w/ more problem-based/project-based instruction? The 800 lb gorilla in this discussion is child care. @wmchamberlain Tech enables us to timeshift. collaboration does not revolve around school time. BTW I do not disagree with you. 4 days could of in class could open up lots of possibilities 4 day 5: research, field work, service, trips. Doable at your school? Change in time (schoolday) and change in space (learning environment) go hand in hand; it can’t be done piecemeal. As a parent, I can’t imagine trying to find care for my kids during day 5? What if my employer doesn’t do 4/10s? How does a 4-day week for students mesh with 5-day work weeks for parents? I like Google’s idea of letting employees spend 20% of time work on personal projects. That could translate well to education. I would rather have an extended day in which the work gets done at school than the current day with hours of homework. How can educators, teachers and administrators, in the same building genuinely work together for the success of students? piersoncci: Indiana study on 4 day wks – http://bit.ly/bNykcB – works best in rural, small districts. My name is John Steltz (@jpsteltz). I am a teacher of students, father of four, and loving, devoted friend to Desiree, my tremendous spouse. My subject area is English/Language Arts. I teach in Seymour, WI. 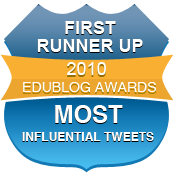 Twitter and #edchat has been instrumental in igniting a spark in my classroom for my students. Thanks to all the members that make #edchat go each week!!! What do you think about a 4 day Week/Extended school day? Leave a comment! 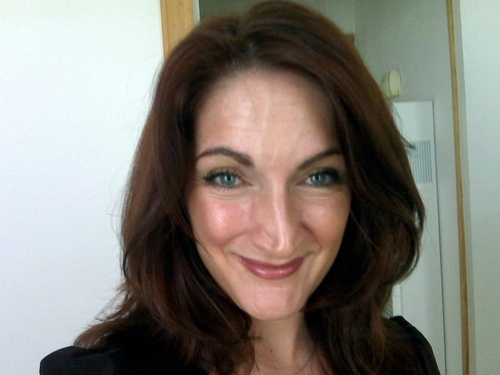 Our thanks go to Melissa Smith (@EduTechSmith) for the guest summary this week. She is a regular edchat participant and great ‘evangelist’ for technology in education. We are very grateful to Melissa for finding time to produce this summary despite having had a sudden family emergency over the past few days. 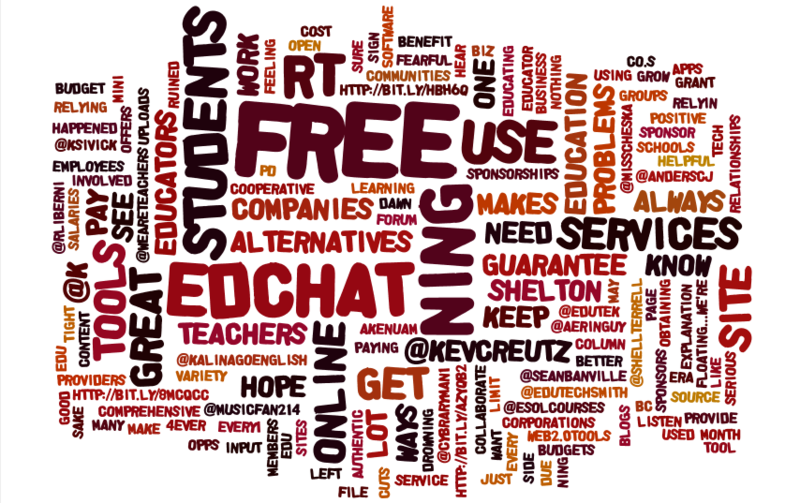 Today’s #edchat focused on the change that NING announced – making creators of NING networks pay for their services. They explained 3 different payment options for those creating NINGS to choose from, keeping a free NING option for those in education, but limiting its members to 150. 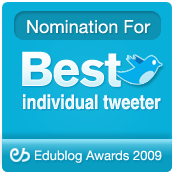 With the reform going on in education, bringing a new type of learning environment into the classroom via Web 2.0 tools, educators expressed the need in continuing to use social media sites to improve on their teaching skills and practices. It seemed that the majority of education-based tweeters understood the desire and need of the business world to earn money off of their products, and recognized the need to pay creators for their work, but also felt that those using this sites for education should be excluded from fees or have a very low price. Teachers are excellent adapters to change, and since we are on limited budgets many folks brainstormed different ways to continue to grow via social networks such as #Edchat now showcasing itself on Facebook, Cybraryman (Jerry Bumengarten) offering to create a databank of our ideas on his site, or partnering up with local businesses to sponsor the NINGS. As the conversation continued several voices discussed the lack of funding that education has in the United States. Ning just seemed to be another great online tool that is now going to make the financially struggling teacher turn his or her focus on finding funds and away from their number one interest: educating the future of America. Voices expressed a push towards businesses coming in and supporting schools, children’s learning experiences, and teacher development – I feel this is what we are going to need to do in order to support, educate, and prepare our youth for the future. @rliberni: Should edu always have free access? 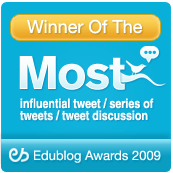 @pysproblem81: #edchat – Ning is just a brand – they come go. Real question, should ‘social’ development be recognized as essential CPD? @andycinek: Wikispaces did this and allowed free private access for K-12, hopefully Ning will continue this trend. @andersch: The whole Ning issue illustrates how our network connections need to be networks of ppl, not platforms. #edchat would continue w/o Ning. @olafelch: Don’t want this to sound nasty, but a grp with several 100 members could find a way to raise the funds. @reportertanya What lessons should we learn from Ning’s news as well as other sites that have changed their services? @sarabest: For use with students 2.95 a month isn’t a lot, but if I have to pay that for every online tool I use it would add up to a lot. @ akenuam : I hear you, i just see what happened to teachertube and grow fearful of ads. It ruined the site. @k_shelton The problem is we as Edu aren’t even floating…we’re drowning due to budget cuts! Creating a plan. What can we actually go and do to help one another create learning environments so that we aren’t reinventing the wheel? pysproblem81: RT @jamesclay: Makes for interesting reading http://about.ning.com/announcement/ wonder if free edu pricing will apply to UK! 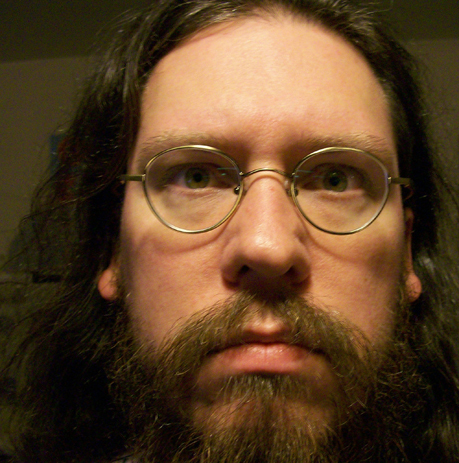 raysadad: Yes, on http://blog.ning.com but name not public yet. – It’s big sponsorship! good promo 4 them! 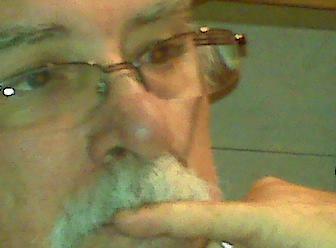 rkiker: @rliberni http://bit.ly/hBH6Q This is a great site with many open source alternatives helpful to edu and tight budgets. 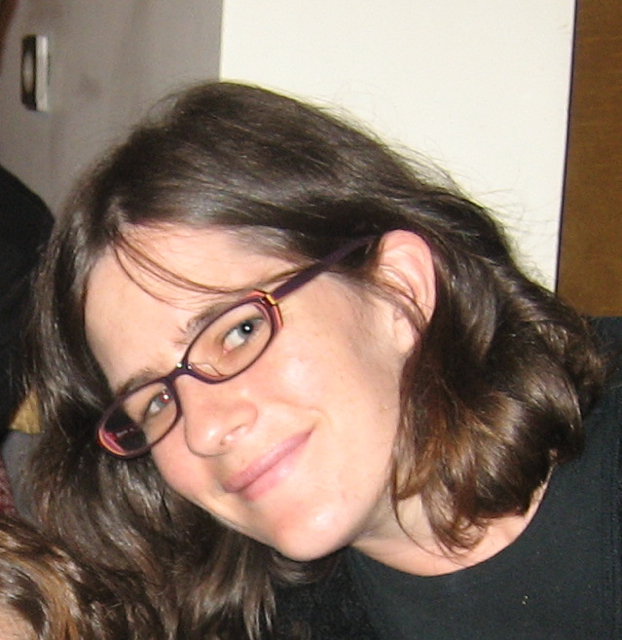 @edutechsmith: Melissa Smith – I have been in education since 1997 and am currently a Technology Specialist, supporting grades 4th through 6th at Presbyterian Day School, an all boy’s school in Memphis, TN. I am also the president for the Memphis Association of Independent Schools, Technology Education Consortium. What do you think about paying for Nings and other tech tools for Education? Leave a comment! Passion in Education is truly alive and well! Yesterday’s edchat followed a slightly different format. In preparation for the webinar with Sir Ken Robinson hosted by The Future of Education and due to take place in the evening, it was decided that a discussion, as a lead in to the webinar would be held. The topic was on passion in education, a theme in Sir Ken’s book, The Element, which was going to be the basis of the webinar. As ever a crowd gathered at the appointed time (though there was still some confusion over clock changes!) and off we went! The discussion was lively and yes, well, passionate! Passion is the love of something for its own sake. Passion in education is about serving others. How to sustain and maintain it? What causes it to go away? Passion is a two-way street, both teachers and students can spark it. How do pay & conditions, systems, testing etc.. affect passion? PLNs can have a strong positive impact on nurturing and growing passion. Does passion translate into vision? Is passion the difference between great teachers and mediocre ones? Here is a flavour of some of the comments. joe_bower: Passion is a love for something for its own sake and someone couldn’t stop you from doing it if they tried. Msmultipoint: Passion is what makes the world go around. Certainly in teaching, there has to be a HUGE amount of passion for serving others. SECottrell: If you don’t have a passion to teach, you will end up wishing you were anywhere else. Horizons93: PAssion is essential for learning. Most schools kill it. tomwhitby: Is the amount of passion the difference between great teachers and mediocre teachers? InspiringEd: Do you feel like passion is more of a goal of education (creating it in students) or a way of approaching the educating process? iangowans: If you think of YOUR favourite tchr growing up, one quality I’d bet you name about them was their passion. akenuam: to inspire passion we need to show how our students are so much more capable than people give them credit, raise expectations. Mamacita: All too often, truly passionate, dedicated teachers are targeted & disciplined for that very thing. Dangerous wavemakers! elanaleoni: #Education is the civil rights movement of our time. Without passion all hope for change is lost. @joe_bower: I wrote this last night in anticipation of today’s passion/Sir Ken Robinson talk on #edchat http://bit.ly/9MREpU I am passionate about this! What do you think about passion in education? Leave a comment!